Beautiful Buildings – Page 2 – We are inspired by beautiful buildings. We create them, preserve them & love them. We would love to connect with other people who care about historic preservation, architecture, or building aesthetics. WELLESLEY, MASSACHUSETTS: Little did I know when I snapped this picture in 2005, it would be the last one I ever took of the Wellesley Inn. This is a little like reminiscing about the horses, after the barn door has been opened…..but I feel I must, for my own peace of mind, blog about this. 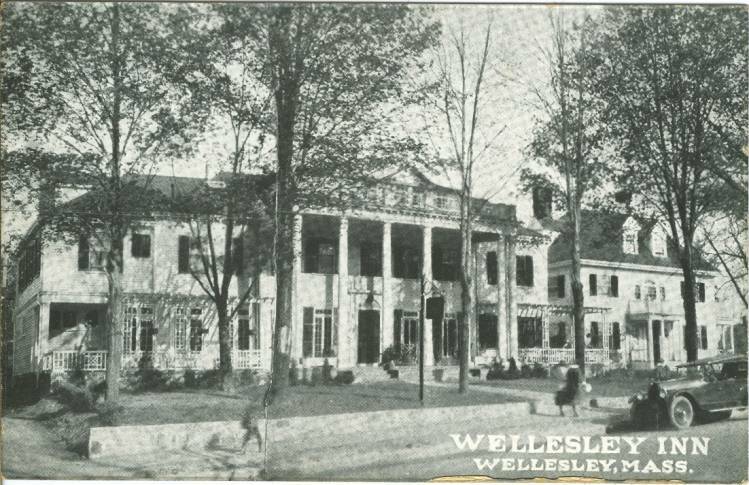 Maybe it’s because I’m 3,000 miles away, so I didn’t get to hear any grass-roots rumblings, but it seems like The Wellesley Inn was torn down with nary a whimper from any of her gentle townsfolk. In researching this debacle, however, I now discover that the Wellesley Country Clubhouse/Original Town Hall/Poor Farm building has gone the way of the buffalo too? Good Lord, people! Wake up! 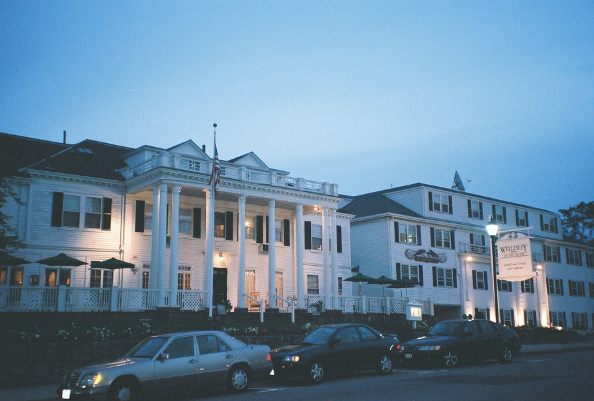 Wellesley Inn History: Built by Boston lawyer Henry Fowle Durant, the stately white Colonial inn has overlooked downtown Wellesley since 1860. Durant used it as a summer home for his wife and 5 year old son. After his son died of diptheria a few years later, a devastated Durant left his law practice to become an evangelist. He ultimately founded Wellesley Female Seminary in 1870, which later become Wellesley College. 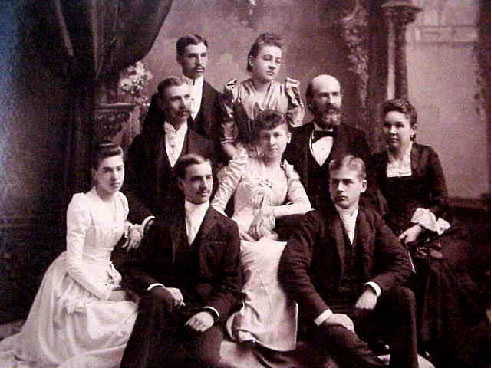 Durant also founded the literary society of Phi Sigma, designed to promote social and academic development. Tea parties were a favorite social event of the society, and students rented part of the inn for their gatherings. Chase and her business partner, Clara Hathorne Shaw, put together a design plan for “The Wellesley Tea Room Corporation” and by selling shares of stock for $5, they had enough money to purchase the house itself in 1901. That same year they began taking in lodgers. The public side included a “cozy reception room, hall, toilet room, and dining room” where they served “luscious griddle cakes and fudge ice cream”. By the way, many stories claim that fudge was invented at either Vassar, Smith or Wellesley. Here is an original 1886 Fudge Recipe from Emelyn B. Hartridge of Vassar College. 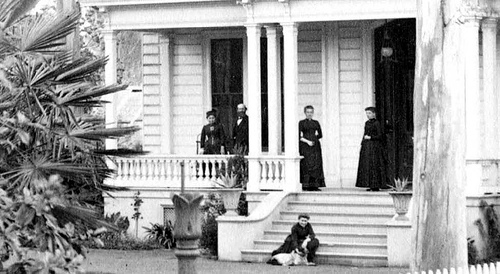 The student half of the inn, on the right, included a reception hall, living room and dining room with Flemish oak paneling, arts and crafts tables, and ”big palms”. In 1914, the inn was sold to Jeremiah Bransfield, whose family managed it for 50 years. They also added the distinctive pillars along the front porch, according to the Wellesley Historical Society. In 1960, the Bransfields sold the inn to William W. White, who refurbished the building, added a motel wing, and opened a tavern near the back. On a personal note, I spent many a happy evening with my high school chums in that old tavern. It was dark as a tomb, and the wooden paneling and low ceilings made it feel like you had just stepped into a pub in England. The Treadway Corp. managed the property for years, before White sold it in 2005. Unbeknownst to me (until it was too late), 146 years of history went up in the puff of smoke in 2006. Letter: Where’s the outcry? Where’s the protection? Oh, and next on the chopping block? My old alma mater, Wellesley High School. Art Deco. Built in 1938. “Perfectly good” as my dad would say. If you know of any historic buildings in imminent danger, please let me know by email at preservation@usa.com or on Twitter at: http://twitter.com/preservation. This manifesto by Jonathan Hale is a must-read for Architecture students, and building lovers. It describes an aesthetic sense that cannot easily be defined. Almost intangible, it is “the old way of seeing” – which has been lost for quite awhile now, resulting in nameless, shapeless, gutless buildings, that we have the unfortunate pleasure of having to view. Hale shows how contemporary architecture slaps on “symbols” of what it’s trying to emulate, without really understanding the mathematics of it. For example, a Victorian commerical building can look beautiful with minimal adornment, if the proportions are correct. Meanwhile, a modern builder trying to make something look “Victorian” will slap a bunch of faux gingerbread on his building, figuring “that ought to do it”. But the builder misses the point. There is a sophisticated system of geometry to beautiful buildings. Hale points out that Audrey Hepburn’s face is beautiful, largely because it is perfectly symmetrical. He uses her face to illustrate “The Golden Section” proportion to the accuracy of 1/1000 of a decimal. This book will definitely fascinate the reader, and it covers a lot of ground. I cannot recommend it highly enough. Perhaps we can convince the publisher to produce another run! WATSONVILLE, CALIFORNIA: The Redman-Hirahara House is a prime example of a West Coast Victorian farm estate home situated on almost 14 acres of farmland clearly visible from Scenic Highway 1 in the Pajaro Valley on California’s Central Coast. She greets passersby like a grand lady who has fallen on hard times, just a faint relic of the noble and gracious beauty that commanded the views of the river and valley from her perch on West Beach Road. 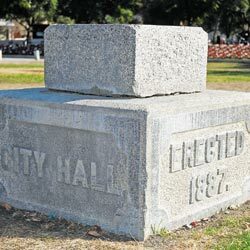 Driving through the Pajaro Valley, travelers cannot miss the stately Queen Anne Victorian which stands in the middle of a farm field as a symbol of history. 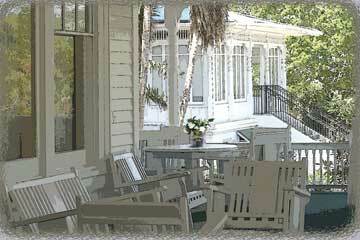 The house was built for James Redman in 1897; designed by renowned architect William H. Weeks. The building contract was let to the local firm of Lamborn and Uren, at a negotiated cost of $3,368. The interior of the home was finished in eastern oak, birds eye maple and natural hardwoods. It was outfitted with all the conveniences for modern housekeeping. When the James Redman family died out in the 1930s, the house and property were sold to the Hirahara family, one of the first Japanese-American families to own farmland in the nation. After the bombing of Pearl Harbor, the Hirahara family, along with the other Japanese families across the state, were removed and delivered to internment camps. 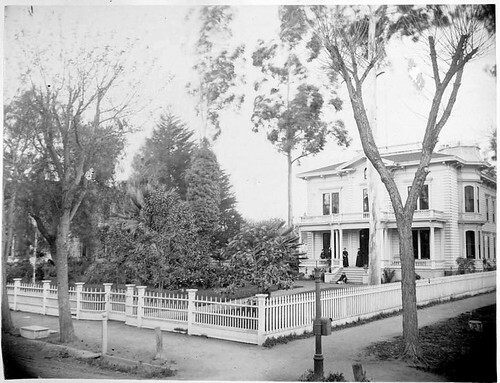 The Hirahara family managed to maintain ownership of the house and land, with the often-anonymous assistance from the Watsonville community. After the war they returned home and made the house and converted barn into an interim home for several other Japanese families while they reestablished themselves in the community. After the Loma Prieta earthquake in 1989, the house and land was sold to Green Farm, a partnership of investors. The land was leased for commercial strawberry farming and the house left to deteriorate. There were “profitable development plans” at that time, much to the dismay of locals. 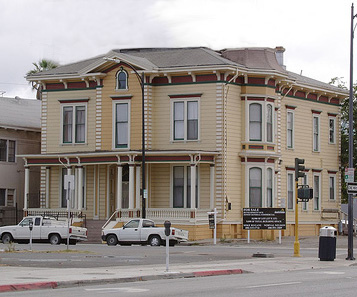 In 1998, a group of Pajaro Valley residents formed The Redman House Committee to determine what could be done to save the neglected and vacant 100-year old Victorian house. The Committee added the house to the National Registry of Historic Places to prohibit demolition, leased the now pallid land and abandoned farmstead, and designed a conceptual master plan to transform the site into a landmark Visitor and Cultural Education center. 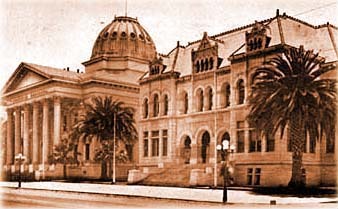 In February of 2005, the property was purchased by The Redman-Hirahara Foundation with borrowed funds for $1.9 million. The surrounding 10 acres of farmland now produces colorful organic crops year-round. To help restore this beloved jewel, go to: Save the Redman House. Old Wethersfield is a charming, historic Connecticut River town founded in 1634. Along Main Street the homes are more than 200 years old, as well as the white-steepled Congregational Church that George Washington occasionally attended. This area is richly endowed with deep, fertile soil, a legacy from the glaciers and the annual flooding of the Connecticut River. As a result of these agricultural benefits, the Wethersfield area has always produced an abundance of seeds. As you come off I-91, into Wethersfield town center, Comstock Ferre Seed Company is front and center in the middle of the downtown fabric. 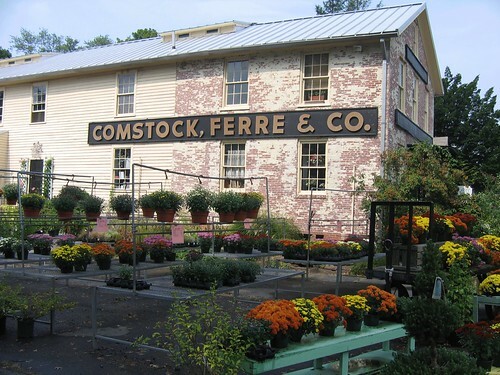 Located in a cluster of antique buildings in the Historic District, Comstock Ferre is the oldest continuously operating seed company in the country. Established in 1820 by James Lockwood Belden as the Wethersfield Seed Company, the original tin signs still adorn the buildings to this day. The company has seen several transitions during its century and a half operation. For the full story, see the history page at the Comstock Ferre Seed Company website. From John Adam’s Diary, August 15, 1774 . Every year, the National Trust for Historic Preservation releases a list of America’s 11 Most Endangered Historic Places. Since 1988 the list has drawn attention to such landmarks as Congressional Cemetery in Washington, D.C., and the TWA Terminal at New York City’s JFK International Airport. The following highlights this year’s “11 Most”—the beloved and significant sites across the country in serious jeopardy. Bonnet House Museum & Gardens is fighting construction of an 18-story hotel that would forever mar views from the estate. Though separated by just 30 miles, Miami’s Vizcaya and Fort Lauderdale’s Bonnet House are both threatened by encroaching development. A proposed high-rise condominium project would mar Vizcaya’s view, spoil the estate gardens, and adversely affect the single-family neighborhoods nearby. At Bonnet House, massive buildings already intrude upon view corridors. Now a developer has received permission to build an 18-story hotel less than 200 feet away. Both homes are historic treasures. Industrialist James Deering built Vizcaya between 1914 and 1916 as a winter residence. His Renaissance villa is a National Historic Landmark, celebrated for its palatial Italianate main house, 10 acres of formal gardens, and native hardwood forest. The property includes a bamboo bar, a shell museum, and an aviary, as well as gardens that are home to monkeys, swans, and the occasional manatee. The west side of central Michigan Avenue is home to structures so visible and iconic that residents call the stretch Chicago’s front door. The “streetwall’s” historic character is now threatened by the inappropriate addition of large towers that would retain only small portions of the original buildings or their facades. Ristorante Puglia, 1919. Lower East Side. Photo credit: Jennifer Emmer. This storied enclave below Delancey Street, once home to thousands of immigrant families, retains a remarkable collection of historic buildings and landmarks. 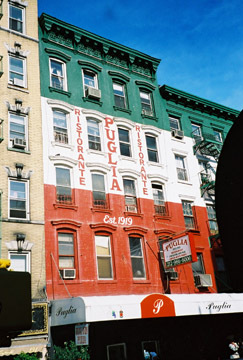 In recent years, an influx of high-rises has threatened the district’s distinctive streetscapes, known for their unusual mix of Federal row houses, tenements, and bodegas. New York City officials will have to designate the Lower East Side a city landmark to prevent further losses and destruction. A 1939 art deco landmark, Charity Hospital has been shuttered since Hurricane Katrina, when levees failed and floodwaters inundated New Orleans. The Louisiana State University medical system deemed the hospital unsafe and endorsed the construction of a new facility alongside a proposed VA hospital. (That would require the demolition of countless historic houses in the neighborhood.) But preservationists argue that Charity can be repaired and reopened to provide services for the poor. 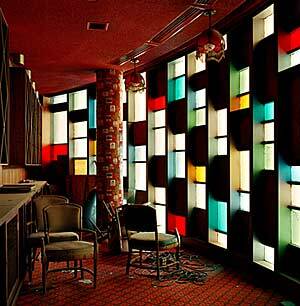 The interior of the Statler Hilton Hotel in Dallas, Texas, is falling into disrepair. A midcentury modern landmark, the 1956 Statler was the first glass-and-metal hotel in the nation. The building has been vacant since 2001, and no buyers have come forward—in part because of a $20 million price tag and extensive asbestos contamination. Barring an innovative proposal for reuse, the hotel will likely be demolished. In 1950, Oliver Brown walked the seven blocks from his home to Sumner Elementary School and attempted to enroll his eight-year-old daughter, Linda. Because Topeka’s schools were segregated, Brown was turned away; he then became lead plaintiff in the 1954 Supreme Court decision Brown v. Board of Education. Today, the vacant school building, a National Historic Landmark, has fallen into serious disrepair despite the city’s pledge to protect it. Topeka’s city council has already authorized its demolition. The site of Lewis and Clark’s portage at Great Falls—one of the most difficult ordeals on their westward journey—has remained largely unchanged since 1805. Now the construction of an enormous coal-fired power plant threatens this National Historic Landmark. (See the story in Preservation’s July/August 2007 issue.) The new generating facility, which will likely include a 400-foot smokestack and several 26-story wind turbines, would alter one of the best-preserved landscapes on the Lewis and Clark Trail. The 1928 art deco theater, built with a towering vertical sign and dramatic mirrored lobby, is the last surviving motion picture palace in downtown Philadelphia. 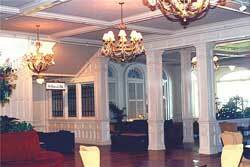 Once host to premieres with Grace Kelly and Tom Hanks, the Boyd has remained vacant since 2002. Unless a sympathetic buyer renovates this landmark, it will remain vulnerable to demolition. To help save it, go to Friends of the Boyd. California’s state park system is one of the country’s largest and most successful. Unfortunately, the system remains drastically underfunded and at risk of deterioration—a result of more than $1 billion in deferred maintenance. Gov. Arnold Schwarzenegger’s proposal to increase user fees for park visitors would do little to remedy this dire situation. More than 100 houses in a community with parks designed by Frederick Law Olmsted and buildings dating to the 1850’s — may be razed to expand the Peace Bridge complex. (The span connects Buffalo to Canada.) Preservationists argue that existing bridges could accommodate traffic, and a truck plaza, without destroying historic neighborhoods. Built by the U.S. Navy in 1932 to house dirigibles, Hangar One remains one of the largest aircraft hangars in the world. However, Hangar One’s outdated siding and other materials are leaking toxic PCBs, rendering the dome-shaped structure unusable unless current owner NASA undertakes a rehab effort to remove the environmental pollutants. Know of a place that needs saving? Nominate it! Across the nation a teardown epidemic is wiping out historic neighborhoods one house at a time. As older homes are demolished and replaced with dramatically larger, out-of-scale new structures, the historic character of the existing neighborhood is changed forever. Neighborhood livability is diminished as trees are removed, backyards are eliminated, and sunlight is blocked by towering new structures built up to the property lines. Community economic and social diversity is reduced as new mansions replace affordable homes. House by house, neighborhoods are losing a part of their historic fabric and much of their character. “From 19th-century Victorian to 1920s bungalows, the architecture of America’s historic neighborhoods reflects the character of our communities,” said Richard Moe, president of the National Trust. “Teardowns radically change the fabric of a community. Without proper safeguards, historic neighborhoods will lose the identities that drew residents to put down roots in the first place.” To date, the National Trust has documented more than 300 communities in 33 states that are experiencing significant numbers of teardowns, and that number is climbing fast. Click here for an interactive map and listing of Teardowns by State and Community. 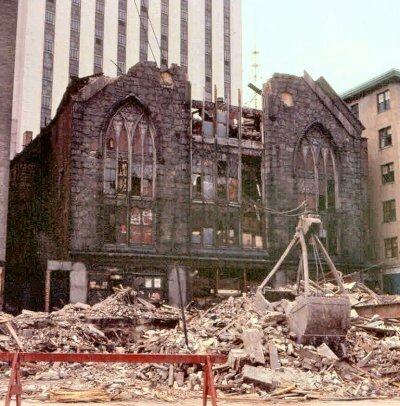 In 2002, the National Trust began work to draw attention to this growing trend by placing “Teardowns in Historic Neighborhoods” on its list of America’s 11 Most Endangered Historic Places. To help arm neighborhood residents, preservationists and local government leaders, the National Trust has published Protecting America’s Historic Neighborhoods: Taming the Teardown Trend to address the origins and impact of teardowns. 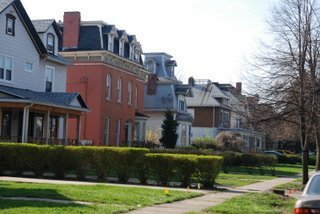 Historic neighborhoods can be protected from teardowns, through a variety of tools and approaches that manage this type of growth. Because there is no “one-size-fits-all” solution or “magic bullet” that will stop teardowns, communities should expect to use a combination of tools. To help with this process, the National Trust is working to show models and profile communities that have developed innovative strategies through the online Teardowns Resource Guide. Teardowns Resource Guide Advice on a variety of tools and approaches community leaders can use to manage teardowns, providing technical assistance and resources to facilitate the preservation of historic neighborhoods. 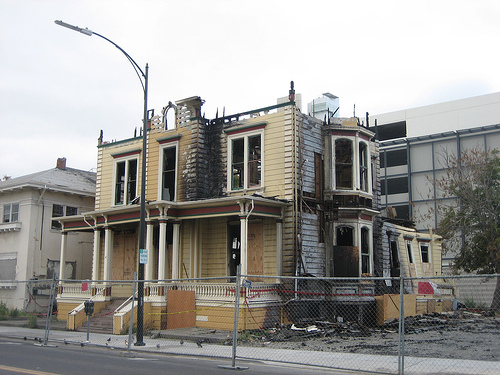 Protecting America’s Historic Neighborhoods: Taming the Teardown Trend Discusses the impact of teardowns–the practice of demolishing an existing house to make way for a much larger structure–on historic places and suggests tools for curbing this disturbing trend. Published by the National Trust for Historic Preservation. Protecting America’s Historic Neighborhoods: Taming the Teardown Trend (pdf) Summarizes the full report. Reprinted from the July/August 2002 Forum News. Published by the National Trust for Historic Preservation. Too Big, Boring, or Ugly: Planning and Design Tools to Combat Monotony, the too-big House, and Teardowns Offers planning and design tools to tame the too-big house, shake free of monotonous development, and negotiate the political minefield of teardowns. Published by the American Planning Association. 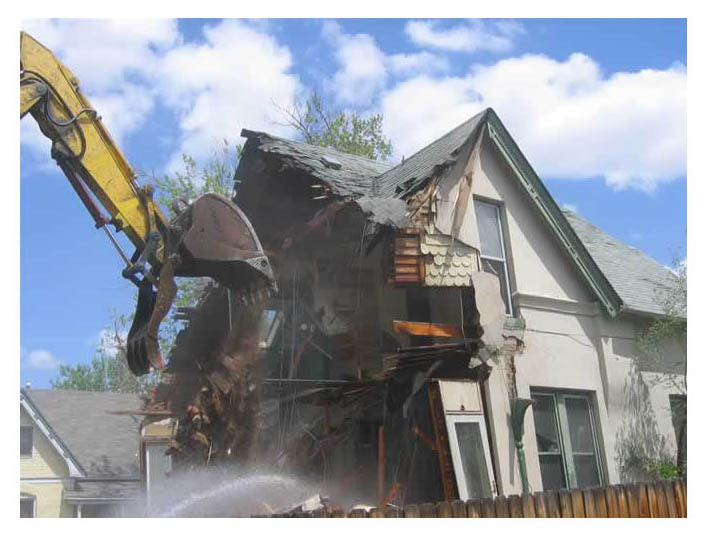 Protecting Potential Landmarks Through Demolition Review (pdf) Explores the use of demolition review, different types, multiple approaches and examples of ordinances. Published by the National Trust for Historic Preservation. Affectionately called “The Mother Road,” Route 66 is known for quirky roadside attractions and unique mom-and-pop motels, constructed between the late 1920 and late 1950s and often clad in neon. In recent years, Route 66 motels in hot real-estate markets have been torn down at record rates, while in cold real-estate markets, motels languish and are being reclaimed by the forces of nature. Stretching more than 2,000 miles from Lake Michigan to the Santa Monica Pier and passing through the states of Illinois, Missouri, Kansas, Oklahoma, Texas, New Mexico, Arizona and California, Route 66 reflects the 20th century evolution of transportation and tourism in the United States. In its early years, the highway facilitated large-scale settlement of the west, saw the desperate migration of Dust Bowl refugees and World War II troop movements, and played a major role in the advent of car culture and automobile tourism. In the postwar era, Route 66 symbolized unprecedented freedom and mobility for every citizen who could afford to own and operate a car. The development of the interstate highway system brought the glory days of Route 66 to an end, and one by one, communities were bypassed and lost their economic lifeline. The final decommissioning of Route 66 in 1985, coincided with a renewed appreciation for this American icon, and recognition that the remaining significant structures, features, and artifacts associated with the road should be preserved. Over the past decade, private property owners, nonprofit organizations, and local state, federal and tribal governments have worked together to identify, prioritize, and address Route 66 preservation needs. Included in these efforts through an Act of Congress in 1999, the National Park Service was directed to administer the Route 66 Corridor Preservation Program that works with partners in preserving and continuing the use of the most representative and significant historic properties along the route. Many historic Route 66 motels are threatened by the compound forces of long-term deferred maintenance and obsolescence while others fall to the lure of cash to demolish and convert valuable real estate into upscale developments. Motels in expanding urban areas are subject to development pressures associated with sprawl. Local governments need to develop policies and financial incentives to support motel properties and businesses. Some historic motels have been successfully rehabilitated and maintained in their original use. The Munger Moss in Lebanon, Missouri, and the Blue Swallow in Tucumcari, New Mexico are examples of motels that cater to a growing base of heritage tourists looking for an authentic Route 66 experience. These motels offer models of “best practices” that others can emulate. Most importantly, the traveling public from the United States and abroad can directly support the heritage of Route 66 by patronizing its historic motels and related roadside attractions. Get off the Interstate and stay in a vintage Route 66 motel. Learn more about the Route 66 Corridor Preservation Program. If you see a neglected Route 66 motel, contact local official about what might be done to encourage continued or adaptive use of the motel. Support our efforts to save these 11 Most Endangered sites and others like them throughout the country. 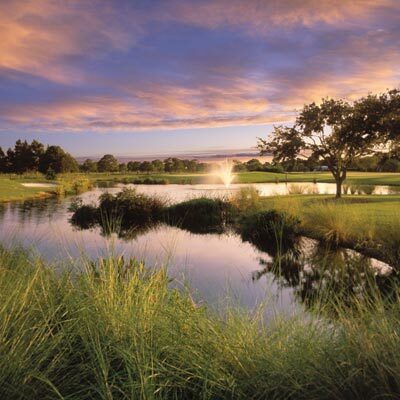 BELLEAIR, FLORIDA: High-rise condos overlooking Clearwater Harbor on Florida’s Gulf coast are the type of development you would expect to see in the state. However, when a multi-million-dollar project called for destroying one of the state’s most elegant century-old hotels in Belleair, Fla., locals spoke out against another 600 condos and a new hotel. Built in 1896 by railroad and steamboat baron Henry B. Plant, the Belleview Biltmore Hotel originally had 500 rooms and was built in three sections, each 400 feet long, with broad verandas. During World War II, the U.S. Army moved in 3,000 soldiers for two years and painted over its Tiffany stained-glass windows and brass fixtures. It has hosted Thomas Edison and Henry Ford, and to Presidents Gerald Ford, Jimmy Carter, and George H.W. Bush. Longtime residents were appalled that the grand hotel that once played host to presidents would be demolished. Last month, their voices were heard when the Belleair town council voted unanimously in early May to delay the demolition as leaders of a citizens group continue to negotiate the purchase of the 21-acre site with owner Belleview Biltmore Resorts, Ltd.
“We now have four commissioners all rowing the boat in the same direction,” says Rae Claire Johnson, president of Friends of the Belleview Biltmore, which is the leading the fight to save the Victorian structure. With that in mind, the National Trust announced yesterday that the Belleview Biltmore is one of America’s 11 Most Endangered Historic Places. Johnson would like to see the creation of a for-profit company that can take advantage of historic-tax credits for the renovation, which would include taking down two dilapidated four-story buildings with small rooms. They would be rebuilt and sold as condo hotel units so the revenue could be used to purchase and rehabilitate of the property, she says. After five years, it would be turned over to the nonprofit Friends of the Belleview Biltmore. Reaching that point in this tiny town of 4,500 took some doing. Preservationists started fighting to save the thriving hotel that was once known as the “White Queen of the Gulf” last fall. After last summer’s hurricanes, more than 320,000 square feet of the roof of the four-and-a-half story hotel was covered with tarps, and the owners, Belleview Biltmore Resorts Ltd., made no effort to repair it. As Johnson sees it, the owner wanted to let the hotel deteriorate to support their claim that it had to be demolished. “I think it was their intention to run it into the ground,” she says. Coupled with that were reports that the DeBartolo Development of Tampa had a contract to buy the property to tear down the historic property and build a smaller hotel and condominiums on 22 acres. So this spring, Johnson and two other candidates ran against the commissioners who were up for re-election. According to Johnson, the Belleair Citizens for Truth spent $50,000 “to defeat us,” and she believes most of money came from the developer. Even though Johnson lost the election, she didn’t back down when owners filed for a demolition permit on April 21. That’s when the National Trust for Historic Preservation was called into the fracas. National Trust President Richard Moe called the owner in an effort to negotiate a deal to save the resort, which includes a pool and golf course. A hotel in excellent condition is rarely a candidate for demolition. 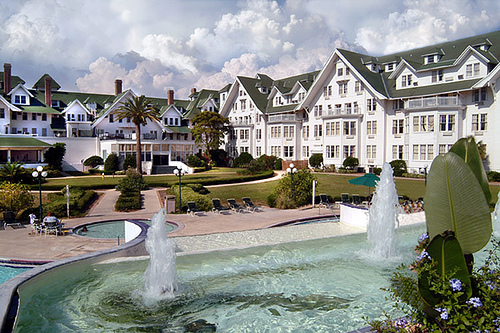 The Belleview Biltmore’s last rehabilitation was in the 1990s, when Japan-based Mido Development spent $10 million on renovations and added a Chinese restaurant. Residents were shocked when the company installed a Pagoda-like entrance, which they nicknamed “Godzilla.” Upset by the Oriental décor, Johnson and others refuse to use that entrance. “A lot of us only go in the original front porch, which is now the rear of the hotel,” she says. The picture above is that lovely, wide-open vista that seemingly landed in Boston like a meteor shower, creating a giant crater. It’s a trainwreck of a public space that I am unfortunately well acquainted with – Government Center, in Boston, MA. 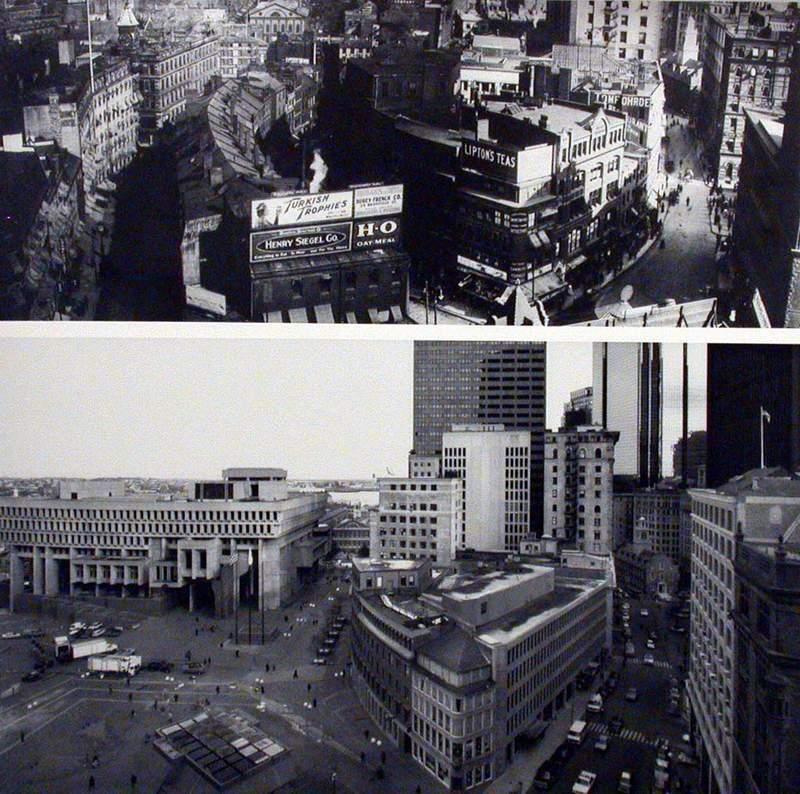 BOSTON, MASSACHUSETTS: Being a Bostonian, and studying the History of Boston at Harvard, I am painfully familiar with all the reasons why Government Center happened. What I cannot imagine is why, 30 years later, it remains one of the most awful public spaces in the country. Boston itself is a superb city, with a rich and varied history. Packed with historic treasures, it is a haven for tourists, who flock to its spectacular sites routinely. 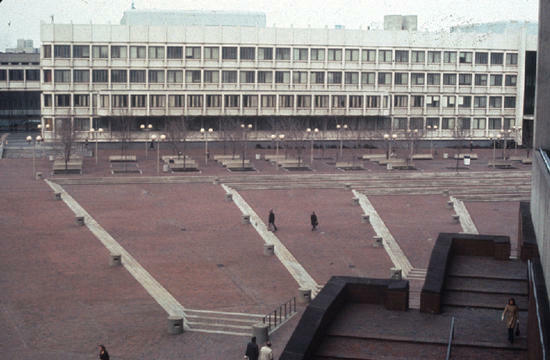 Government Center has become the eyesore that won’t go away, in an otherwise magnificent city. 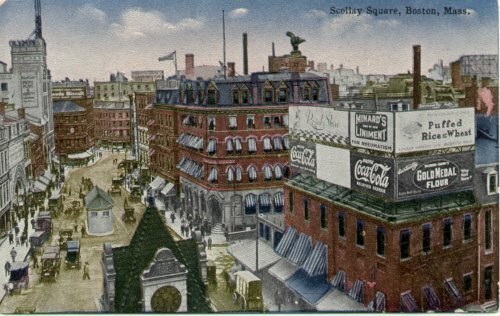 Scollay Square, the unfortunate area which was decimated to make way for Government Center, was a far more interesting and historic area, albeit a tad dicey. Since Boston was a seaport, it was always a haven for immigrants, and with them, came a rather unseemly lot of folk. One infamous place for congregating near the waterfront, which later became a den of iniquity, was Scollay Square. This area was a hotbed of activity, where international seamen and merchants frequented rather bawdy taverns, took in vaudeville and burlesque shows, and other intriguing entertainment. Scollay Square started out as Boston’s home to the elite and ruling class. John Winthrop (the founder of Boston and first Governor of Massachusetts) lived nearby, as did many other city and state officials. During the siege of Boston in 1775/76 the Brattle Square Church housed British troops. Today, this site would be the base of City Hall at City Hall Plaza. As immigrants who followed in the mid- to late-1800s, changed the character of Boston, the elite began to abandon the Square, and by the 1880s, it had become the center of commercial activity in Boston. The Square played a large role in the 1919 Boston Police Strike, brought on in part by the dramatic cavalry charge, ordered by Governor Calvin Coolidge, to disperse the “15,000 ruffians” who had gathered there. It might not have been perfect, but it sure had character. The city officials were sick of the bar-room brawls, and occasional all-out riots that occured there. By the 1940’s and 50’s, Boston’s economy had become quite depressed in this area, prompting officials to take drastic measures to clean the place up. Why is Boston still stuck with this bloody thing? First off, the new attempts at redesigning it fail to take in the concept of the community, and how it congregates, as well as its nearby neighbors. “It proves once again that design competitions accomplish little if nothing in creating great places. What does this say about design in a city with so many prominent designers (as opposed to placemakers) – a city where all the truly successful places are older? Reprinted from The National Trust website. SAN FRANCISCO, CALIFORNIA: Once headquarters for the Coastal Artillery Corps that guarded the entrance to the Golden Gate Bridge during WWI, Pilots’ Row embodies the dawn of the era of flight in the American West. Understanding the usefulness of airplanes for artillery reconnaissance during WWI, the Army built an airfield along the Presidio’s northern shoreline in 1919. The field was augmented by a crescent of hangars and warehouses in 1921. At the same time, thirteen officers’ quarters—known as “Pilots’ Row”—were constructed nearby to house aviators and their families. Today, these houses, located in the Golden Gate National Recreation Area, are vacant and have not seen attention for more than two decades. All contain lead-based paint and hazardous materials both on their interior and exterior and are highly susceptible to earthquake damage. 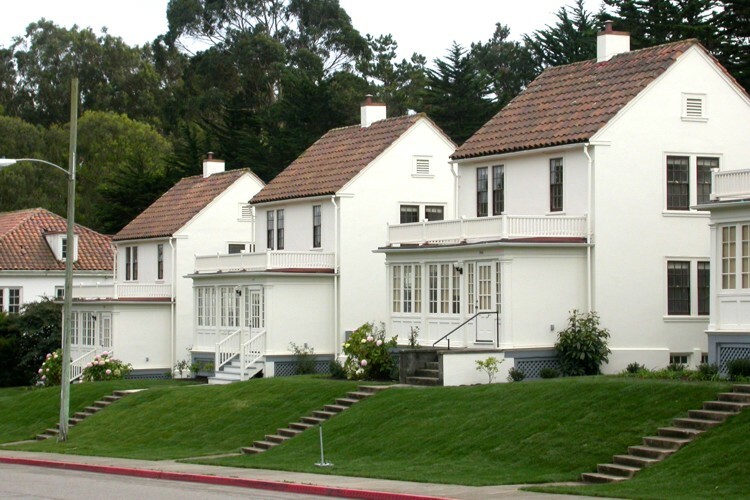 Grant funds of $50,000 will be used by The Presidio Trust to restore the homes for civilian use and to help preserve a national park and National Historic Landmark District.